It's funny how you meet people through social media today. I’ve been following Samantha on Instagram SDIONBAKERDESIGN for quite some time; she does amazing drawings and has a cute sketchbook curating her everyday life in New York with two boys, a husband and what else life brings. Coincidentally, I ran into her as her boys played at the same summer soccer camp as my son and it turned out that she was planning her vacation in Denmark and could use some tips. She is as sweet as her drawings so I enjoy meeting with her from time to time. We share the same curiosity of the city, always wanting to explore and find new places, so she invited me for coffee in Dumbo to show me some of her favorite spots. With my Danish genes, I of course rode my bike to meet her. I took the Brooklyn Bridge to get to Dumbo, as the Manhattan side of the bridge starts right in my neighborhood, but you can also take the Manhattan Bridge from Chinatown. There is always a stunning view from the Brooklyn Bridge, although it can be quite busy with foot and bike traffic heading in both directions; Brooklyn Bridge is the most popular bridge for tourists visiting New York. In Dumbo, my usual stop is a coffee place on Jay Street called the Brooklyn Roasting Company. Samantha wanted to show me this tiny, cute patisserie named Patisserie Burrow, owned by a Japanese man. The patisserie is situated in the back of a hallway so, if it hadn't been for her, I'm not sure I would have noticed it. I had a hard time deciding among the many delicious treats so I ended up buying way too many, but I got it wrapped in fine little box with a ribbon around it. For cakes and sweet treats there is also a nice café, One Girl Cookie. Originally Dumbo was a ferry landing and industrial area. In the late 20th century it was bought by a developer and his company and made into an upscale residential and commercial community. 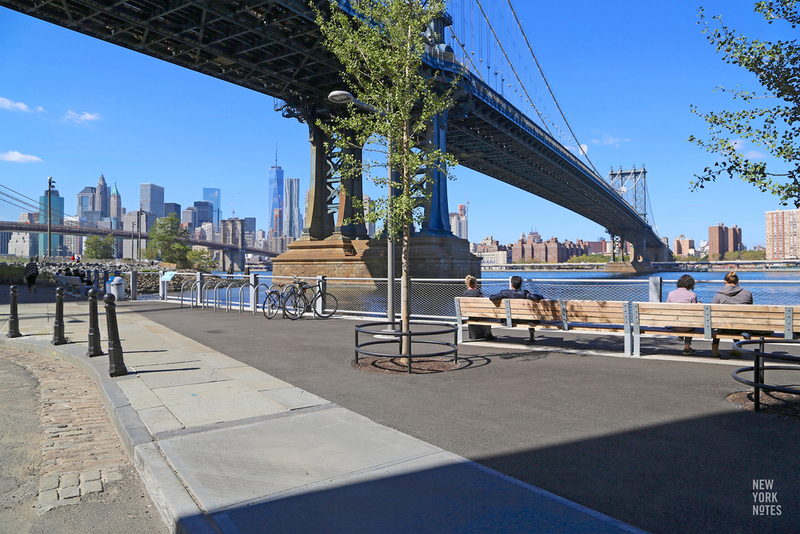 Initially a neighborhood of artists’ studios and galleries and now a center for technology startups, Dumbo has become Brooklyn's most expensive neighborhood, as well as New York City's fourth wealthiest community overall. An illustration by my friend Samantha Dion Baker.